Jerry Vermillion in front of his sleeping spot at the old Northrup Food Center. Photo by Thacher Schmid. Conversations about homelessness too often devolve into stereotypes, such as “it’s their choice,” “they’re not from here,” “he needs to get a job,” “it’s not their fault,” etc. Jerry Vermillion’s story transcends paint-by-numbers talking points. Vermillion, 52, has been living at the vacant Northrup Market on 21st Ave. a couple of blocks from his last apartment. He faces the loss of his covered sleeping spot due to imminent development. He’s not sure where he’ll keep clothes, possessions and change, or where he’ll find a place to listen to his transistor radio. He’s just one among an estimated 9,461 homeless individuals in Oregon—5,413 of whom are without shelter, according to a 2015 federal report that says Oregon has the fourth-highest rate of unsheltered homelessness in the United States. 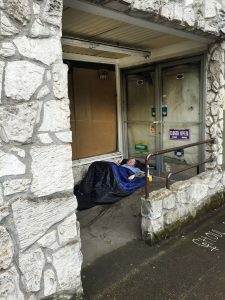 Vermillion is “economically homeless,” part of a little-studied but growing group of working homeless in Portland, said Senior Director of Public Policy & Funding Tony Bernal of Transition Projects Inc. The complexities of Vermillion’s story suggest the long, hard road ahead for those seeking solutions to our homeless crisis. Vermillion works nearly full-time at the Astro gas station at Northwest 21st and Marshall, and does other work on the side. He grew up amid affluence, and is surrounded by it now. He eats at local restaurants and uses the new BIKETOWN bicycle share rentals. Meanwhile, he’s living on the street, facing his third chilly winter without shelter. One moment, he says his situation is his own choice, part of his love for freedom. The next, he speaks about market and other forces outside his control. Bernal said there are “over a thousand” people on TPI’s shelter wait list. If Vermillion decided to seek shelter today, the wait would be “between one and seven months” for TPI’s three shelters. He could also try the Portland Rescue Mission’s lottery or spend $5 to stay a night at City Team Ministries. The shelter proposed at Terminal 1 is no longer a possibility, but Vermillion never considered it an option. “In general, I wouldn’t want to be in a facility like [the one proposed at Terminal 1],” Vermillion said. 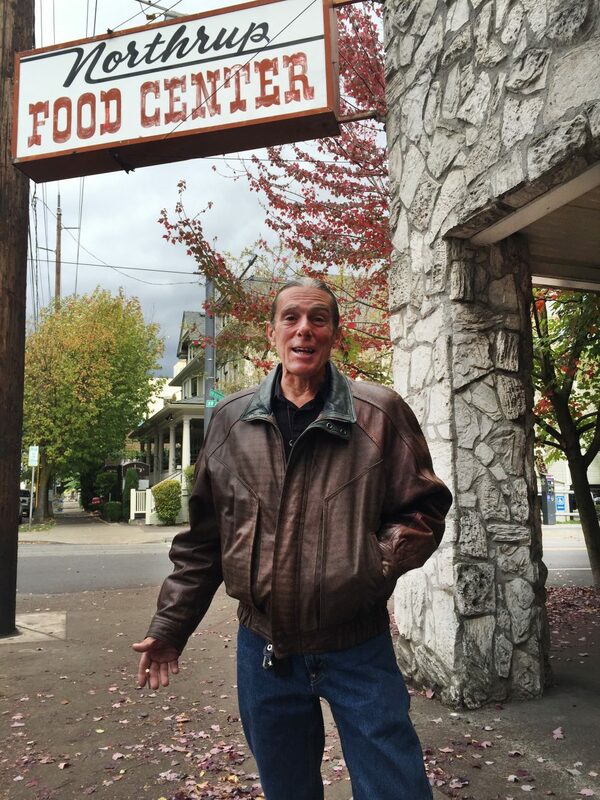 Interviewed at Anna Bannanas on a blustery fall day that featured a classically Portland mix of sun, rain, mist and dancing leaves, Vermillion wore a brown leather jacket that matched his eyes, peace sign necklace, earrings and new hiking boots. His ponytail was carefully combed and slicked back. You’d probably never know he was homeless if you didn’t see him sleeping in the alcove along Northwest 21st. You certainly wouldn’t assume it while watching him work. Vermillion is not only hard-working, he’s community-minded, despite not being a homeowner, or renter. In large rains, Vermillion said he often cleans out storm drains in the area that tend to clog. It’s something he started doing when he worked at the Chevron station a block south of the Astro. Portland’s been home for 13 years, he said. He came from Philadelphia, but these days he complains about umbrellas like a native. He’s a sharp, steady guy, carefully groomed, with none of the symptoms of mental illness or addiction seen among the city’s unsheltered people. He drinks alcohol and uses marijuana, but said he eschews hard drugs like methamphetamine—whose mention by a reporter elicited a physical shudder, because Vermillion says the drug is all too common among Portland’s homeless. Cheryl Vermillion said her brother Jerry has struggled with alcohol dependency, and she herself was a “full blown crackhead” for a time. This tough childhood perhaps explains Vermillion’s apparent ease with his current unsheltered situation. Vermillion said he was given a $340 tip, which he guessed was from a NW Examiner reader after his situation appeared in the June issue. His sister calls him the “mayor of Portland” because he knows everybody. He greets passers-by frequently, and his phone buzzes constantly during an interview. With winter coming, though, she is worried about her big brother. Their mom died two nights before Vermillion’s interview with the NW Examiner. What if he had a magic wand? You mean, like a room or a tiny house? That economic challenge, these days, isn’t just housing. Affordable housing is the news topic du jour, but Vermillion said rising food costs “kill” his monthly budget as much as anything. Still, he earns enough to put something toward housing. “I could pull about $600 a month rent,” he said. A Zillow search of apartments in Northwest Portland started at $825. In any case, he doesn’t see himself as any less of a member of the neighborhood than those with mailboxes and driveways.